PASADENA - Too late for this summer, but a fire road closed by landslides 3 1/2 years ago could be ready for use by hikers, bikers and horse-back riders by August of next year. The Mount Wilson Toll Road will receive $1.48 million in improvements through a grant from the Federal Emergency Management Agency approved this week by the Pasadena City Council. Work to clear the storm-caused landslides is scheduled to begin in October and continue through April. The road likely will open in August 2009, after Los Angeles County officials complete work on a section owned by the county, said Chief John Todd of the county Fire Department's Forestry Division. "Once (Pasadena) has done the work on the bottom of the road it will be easier for us to get our work vehicles in there," he said. The city owns and maintains the bottom part of the road while the county Fire Department maintains the upper part. It also has a facility at Henninger Flats, an area about 1,400 feet above Eaton Canyon. Todd said the county plans to use its own equipment and labor to do the work. No cost estimate has been made at this time, he added. Bernard Melekian, the interim city manager of Pasadena, said the city's main concern with opening the fire road is to ensure firefighters can get up into the hills in case of a blaze. "If it were just about getting the trail back to hikers we probably wouldn't be acting, because I think they can still get up there without any problems," Melekian said. 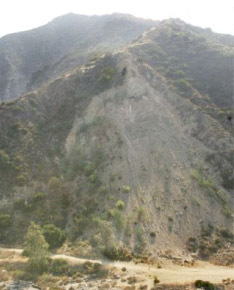 Hikers still can access the road above the major landslide by taking a steep equestrian trail near the Eaton Canyon Nature Center, according to Mickey Long, a county parks and recreation administrator who is based at Eaton Canyon. Once they reach the toll road they technically are not allowed to go any farther, although no signs that say it is closed appear until higher up the road. 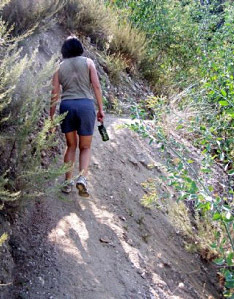 Hikers frequently go up to Henninger Flats, according to Long. "We hear they are going up there all the time," said Long. "The county has told us it really isn't safe for hiking." About five or six hikers were spotted on the trail within an hour period. Dolores Bravo, 52, a teacher from Alhambra, said she was hiking the trail for the first time and had no idea it was supposed to be closed. "It was a nice, wide road, and then it suddenly became more like a goat trail," Bravo said after hiking through a section of the trail that was washed out. A sign warning of the trail's danger was posted on the other side of the washed-out area. At this week's council meeting, city officials also considered a $732,107 contract to rebuild a collapsed bridge along the Arroyo Seco in the recreation area behind the Jet Propulsion Laboratory in La Canada Flintridge. The bridge collapsed during the same stormy winter of 2005, about a month after the toll road was washed out. It is used by hikers and maintenance vehicles to access National Forest areas. The council delayed action on the item, however, after several council members on the Finance Committee asked for more detailed financial information on the contract, according to Melekian. It likely will be considered at Monday's meeting, he said.